Learn to do common things uncommonly well. 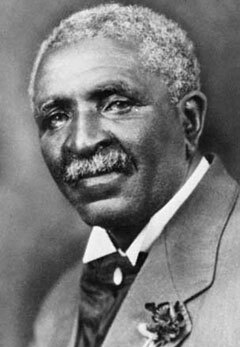 George Washington Carver, a leader in agriculture innovation and a proud son of Missouri, was born about 1864 (exact year unknown) to Moses Carver on a farm near Diamond, Mo. Now a role model for determination and persistence, tragedy affected his life before birth when his father died in an accident. Still an infant, Carver and his mother were kidnapped by slave raiders. Although baby Carver was returned to the farm, his mother was never heard from again. Carver wasn’t a strong child and could not work in the fields which forced him to help with household chores and gardening. Through many hours of exploration around his home, Carver grew a strong interest in plants later becoming nicknamed “the plant doctor.” He had an impeccable thirst for knowledge that eventually led him, at the age of 12 to his first schooling experience - a one-room schoolhouse in southwest Missouri. After attending high school in Kansas, Carver was accepted as the first black student to Simpson College in Indianola, Iowa. With aspirations of having a career in science, Carver transferred to the Iowa Agricultural College (now known as Iowa State University.) In 1894, Carver gained his Bachelor of Science degree and earned his Master of Science in bacterial botany and agriculture in 1896. Dr. Carver became the first black faculty member of Iowa College. Later in 1896, Dr. Carver was invited by Booker T. Washington to lead the Agriculture Department at the Tuskegee Normal and Industrial Institute (later known as Tuskegee University). Dr. Carver remained there for 47 years. Dr. Carver was very interested in helping poor southern farmers who were farming on low quality soil depleted of nutrients after decades of growing only cotton and tobacco in the same soil. Dr. Carver and others encouraged farmers to restore nitrogen to their soils through systematic crop rotation – helping the region to recover. Dr. Carver established an agriculture extension in Alabama and founded an industrial research lab where he worked tirelessly on the development of hundreds of applications for new plants. Carver discovered more than 300 uses for peanuts and hundreds more uses for soybeans, pecans and sweet potatoes. According to the National Peanut Board, Dr. Carver published the research bulletin, "How to Grow the Peanut and 105 Ways of Preparing it For Human Consumption." During that time, the boll weevil had destroyed the cotton crop and many farmers had turned to peanuts as a cash crop. Alabama residents saw cotton oil mills converted to produce peanut oil. This was something that farmers could thrive on - livestock could eat the peanut plant and sharecroppers could feed their families on crops that weren't sold. Dr. Carver and the peanut helped save the economy of the southern part of the U.S.
After a lifetime of achievements, recognitions and awards, Dr. Carver died in 1943, and is buried on the campus at Tuskegee. Upon his death, Franklin D. Roosevelt sent this message, "All mankind are the beneficiaries of his discoveries in the field of agricultural chemistry. The things which he achieved in the face of early handicaps will for all time afford an inspiring example to youth everywhere."